This would be pretty awesome! A nice little pay-it-forward thing. Thanks. This story is a big part of the reason that I throw money at Frog God like I throw at Paizo and used to throw at TSR. Great company, great products. I also love when the customers turn around and do something awesome like giving it away like this. Very awesome of you! Also, if it wasn't obvious, I'd love to win either of these, and I live in the US. Thanks again for your generosity! I missed out on the RA Kickstarter, but am reading through Sword of Air and loving it. Oh, I didn't say, I'm looking for either and am a US resident. Hmmm, it appears my first comment got eaten. Something about having my nose pressed against the glass looking in on RA in the candy store. I keep meaning to buy Rappan Athuk, but balking a bit at the price. I'd be happy to win either though- I am a big fan of Frog God Games and S&W. Worth a shot! 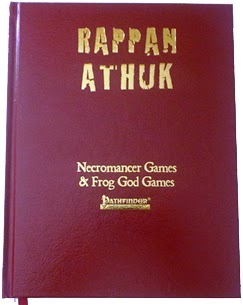 Those Frog God big packages are off-puttingly spendy, but I hear good things about Rappan Athuk. I've always been interested in RA. No matter what, I hope these books find a good home. RA is a tome of badassery! I have always wanted a copy! Oh I have been wanting to look at Rappan Athuk for awhile. Count me in, please! Awesome initiative! I'm just starting up a Swords & Wizardry Lost Lands campaign, so either of those would be cool to add to the setting. Being a Northlander, I would also be happy to pay for shipping to the cold North if you would consider shipping the book over here. I'm in Sweden! That's pretty cool. I've purchased lots of Frog God books, but not Stoneheart. Count me in as well. Love me some Orcus. Backed some newer Frog God but don't have these older ones. Great offer! I've been enjoying Stoneheart Valley and SoA. Rappan Athuk would be a welcome addition. Thank you to both you and FGG for your generosity. The Lost Lands are quickly filling out! Hi, please count me in. Very kind. I'm in the UK. Bobug says, check it out! USA, California. I humbly submit my name for consideration. I took would like to enter. I would like to enter the giveaway, too! Can't win if I don't enter. Thanks for the opportunity! I was part of the Rappan Athuk KS too but couldn't afford any add-ons so Stoneheart Valley would be a much appreciated addition. I'm in Canada. Very cool. I've heard neat things about Rappan Athuk. That's awesome I have been considering that for a long time. I rolled a 20! Looks like I win! Those are the rules. A chance for S&W Rappan Athuk? Count me in on this for sure! 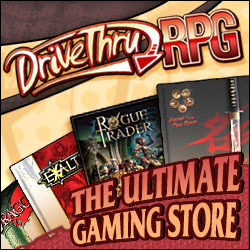 It'll help compete my FGG collection! I would love this to run a S&W campaign with these! I would love to win something! Thanks! Very generous of you good sir. I humbly submit my name. Count me in for Stoneheart Valley, but I'm not interested in Rappan Athuk, as I already have the original soft bound books. Thanks! I would be interested in the RA book, already purchased the SV one...thanks for the chance! PLEASE pick me Mr. Moore! Would love either, esp Sword of Air. I ran RA (by way of pdf) and it lasted for about a year. That's kind of you...would love either (and hope either would love me back unconditionally). Wow, thanks! Either one for the US would be great! Very generous, so here's hoping I win! Thanks for the opportunity! Count me in. I live in the US and don't have either book. You are being quite generous. This is really awesome of you! What a cool way to pay it forward! I've been really curious about Rappan Athuk for some time now. Ooooh! I would appreciate either of these two beautiful tomes. Very grateful for the opportunity. Thank you. I would love either one! Very cool. Hope to have a chance!